Slang: difficult, hairy, bad, nasty, cool, good. I don’t even really know what that word means, how can something be good and bad all at once? All I can imagine is surfing…some guy saying “Gnarly!” when a big bad wave comes along and someone manages to surf it! This is some marketing person’s idea…I would have never named it this. I’ll take the (useless) definition and apply to create ‘gnarly natives’. It might be a bit of a stretch, so bear with me. For its difficulty in siting, coolness in form and function. What could be more coolly alluring in the tree world? A tall rounded tree with smooth gray bark. Shiny, dark green leaves with a leathery texture are among this plant’s finer features. In fall, the leaves are often a beautiful burnt gold color. An old beech grove brings on a profound sense of serenity, stability and timelessness. American Beech is at the edge of its range here in Wisconsin. Mostly found on the eastern edge of the state. In these eastern forests it is part of the climax regime of plants along with Sugar Maple and Hemlock. It abhors disturbance and needs long term stability to have a strong presence. It can withstand shade when it is smaller and suckers easily from the roots when established and large. Thus, it makes a grove of itself and persists in these highly competitive forests. When planting it in your yard – it can be difficult to site and establish. Many trees placed incorrectly will only survive a few years before succumbing to a myriad of problems. This tree must be sited well to thrive. It seems to prefer acidic sandy loam and cannot withstand much soil compaction. A protected surrounding is best – no exposed lawns or street side plantings. Its smooth bark is not very thick and is prone to damaging winter winds and sun. I bet it also needs a mycorrhizal association to do well. Mimic its native soils as much as possible to experience success with these gnarly natives. At Johnson’s Nursery we plant them as near as we can to woodlots on the property. It’s carvable and elephantine bark is often inscribed with all manner of messages to the world. “gus wuz hear” and “Jenny + Karl 4ever” inside a heart shaped etching. Most of the messages I have seen were in poor taste – so I would recommend sticking to the modern version of beech-bark carving. For its uniqueness, and fine looks. This plant doesn’t take up a lot of room. In fact, it seems to enjoy crowding. Big shrubs, solid canopy under trees, and even among other vines. 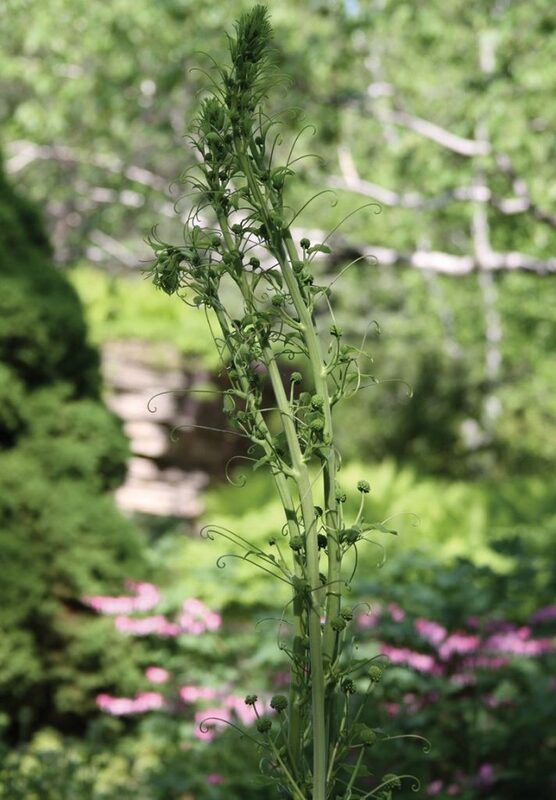 It leans of its friends – and uses their height to get just enough. It looks a little like Jack’s beanstalk. Once it gets about 5 or 6 feet off the ground, it leafs out with little clusters of strange greenish flowers. After they get their due pollination (from flies – I think they’re attracted to it – thus the name) they form pretty clumps of blueish black berries that, together, can get larger than a golf ball. They hang around quite some time until they get swiped by some critter or another. Normally – when you’re picking seed – you can kind of see how a plant gets around. It has a tasty fruit – sure a bird will eat that and move the seed somewhere else. A meaty nut – yeah – a chipmunk or squirrel will bring that over 50 yards and plant that there. A winged samara – It’ll fly away from Mom and land in a new land – hopefully fit for growing. Luck of the draw. Then you get Carrion flower – which seems to me like the least appetizing fruit that I have ever seen. There’s no meat on the thing….it looks like a thing a bird might go after…but why would it take it…I had a thought. 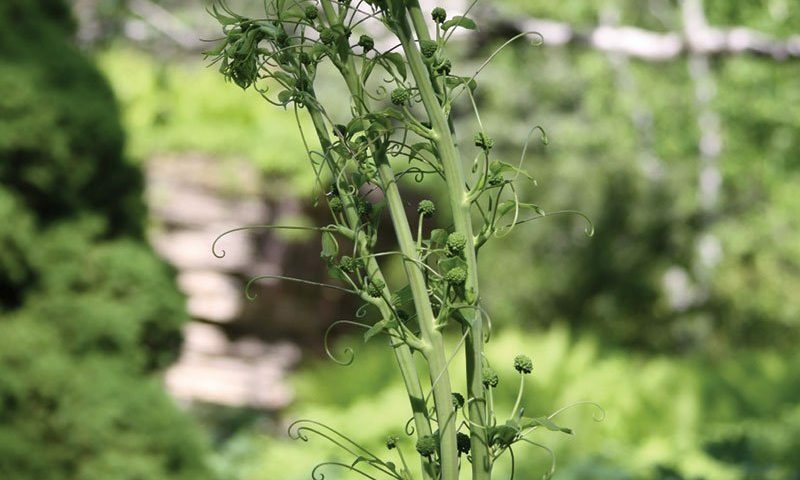 When picking seed for this plant, it seems like it’s often hanging out with the likes of wild grapes and Virginia creeper. But those at least have some sugar in them and some meat surrounding the seed. Then it dawned on me – what if it’s a grape-mimic? In the frenzy to get the grapes off the grapevines, what if Carrion flowers have been bred by birds to be like grapes. Any plant that had seeds that looked like a grape got picked by the birds on accident. Just a thought. I hope to witness something willingly targeting the plants, but for now I imagine it’s an overzealous bird grabbing at whatever appears to be a grape. It doesn’t seem to need any special soil requirements. But I’ve never seen it in very dry soil, so that might be worth looking into. It can grow in nearly full sun or full shade but somewhere in the middle is probably where it’s most happy. It does need somebody to lean on. For its neat flowers and otherworldly appearance. Jack in the Pulpit is just a bit otherworldly, making it part of the gnarly natives category. As far as flowers go – this one doesn’t easily fit the norm. It’s oversized for how big the rest of the plant is. The flower is green with neat dark maroon to almost black striped markings. The little bulb it grows out of looks to be some kind of spaceship, with knobby protrusions that come out of the side with eerie regularity. The leaves look somewhat out of place in the northern temperate forests in which they are found – being large, soft and having fleshy stems. After the flower is spent, a large cluster of red fruits develop, which remains even after the rest of the plant has gone dormant for the season. In places with high populations, they litter the forest floor like someone (or someTHING) threw them there. Because of the uniqueness of the flower, it’s one of the easiest of the gnarly natives to learn. I knew the name of this plant soon after I could walk. If kids like it, it must be cool. It doesn’t require much to be happy – just a little semi-shaded spot in average soil and it will be plenty happy.